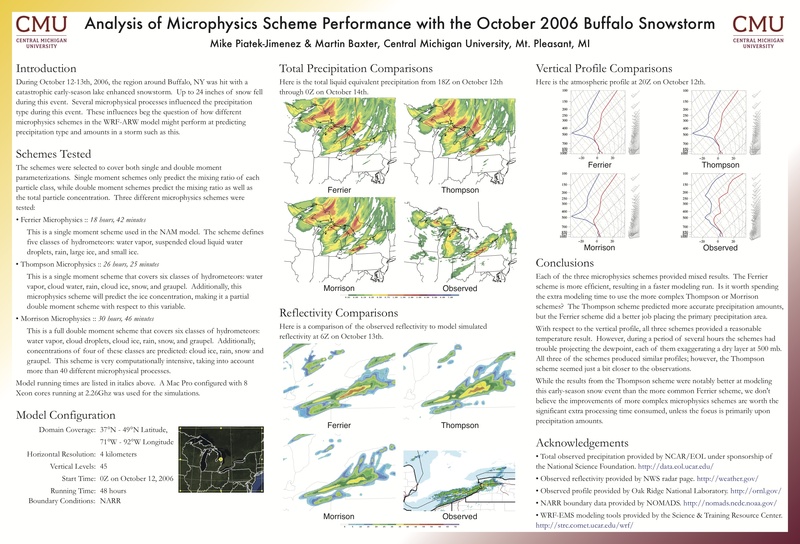 I talked about modeling the October 2006 Buffalo Snowstorm in my last blog entry. I just wanted to follow-up with the results. Here is an image showing the final poster. I presented the poster at the National Weather Association’s Annual Meeting held in Tucson, AZ this past October. The poster session was about an hour and a half if I remember correctly, and during that time I had a chance to talk about the project with a lot of people. It was fun to discuss the outcome from all the work I did on the project. A few weeks later, I was pleasantly surprised to hear I had won the Best Undergraduate Student Poster Presentation award! In the end, all the time and effort I put into it was well worth the results. I’m not sure if/when I will do this again, but I’ve learned a lot about what is involved in meteorology research, and have found that I rather enjoy it.